As the 2018 elections approach and 2020 looms over the horizon, Democrats are discussing and embracing a host of big-ticket progressive agenda items, from taking on big pharmaceutical companies to ending cash bail to guaranteeing every American a job. However, as activist organizing continues to push these ideas onto the agenda, centrists within the party and the commentariat have expressed concerns about their political viability. Because the policies that are exciting progressive voters have not yet caught the attention of most pollsters, debates over how ready the broader electorate is for a more progressive Democratic platform have been reduced to mere speculation. We set out to change that, and we commissioned polling on major progressive policies with YouGov Blue. The survey, fielded between July 13 and 16, included 1,515 eligible voters and is weighted to be nationally representative. We chose policies that haven’t been polled often, but could be central to the 2020 Presidential election. We're excited to present the data on these issues, and we’ve created a tool that allows you to explore the data yourself. For simplicity, we often discuss these policies in terms of net support, which subtracts the percent in support of a policy from the percent opposed. We find that the punditry has vastly underestimated the potential of an unabashedly left progressive agenda. Four issues stood out in our polling as issues that have strong and durable support. Creating generic versions of life-saving drugs has a whopping net 30 percent support among eligible voters (51 percent support, 21 percent oppose). A public option for internet, a proposal that Abdul El-Sayed has campaign on in Michigan, has net 39 percent support (56 percent support, 16 percent oppose). A job guarantee, which is supported by Senators Kirsten Gillibrand, Cory Booker and Bernie Sanders is quite popular, with 55 percent of eligible voters in support and only 23 percent opposed. As we’ve discussed in The Nation before, there is strong evidence that even with a partisan framing and pay-for, the policy remains popular. We modeled our question off of the proposal made by economists Sandy Darity, Darrick Hamilton and Mark Paul, which centers community job creation. In addition, We also find that ending cash bail has a net positive support of 21 points (45 percent in support and 24 percent opposed). Senators Kamala Harris and Bernie Sanders have both unveiled legislation that would end cash bail, which leads hundreds of thousands of people to be locked out despite never being convicted of a crime. Perhaps most importantly, these four policies are popular across urban, suburban and rural geographies. Two of the key policies, generic pharmaceuticals and a public option for internet are actually more popular among rural voters than urban and suburban voters. This is surprising when you consider that our generic ballot item shows Democrats with net support of +29 points among urban voters, -3 among suburban voters and -4 among rural voters and that in 2016 Clinton lost rural voters by 18 points while winning urban voters by 26 points (for the generic ballot and 2016 vote, we examined registered voters, for the policies we examine eligible voters). Our generic drugs proposal is popular with Trump voters (47 percent support, 31 percent oppose), a rare example of Trump supporters expressing positive views of a proposal that would most likely be associated with Democrats. Public internet also had support among Trump voters (43 percent in support, 28 percent oppose) and is one of the most broadly popular policies we have polled. These counterintuitive trends appear to be driven by material needs as opposed to ideology. For example, the relatively strong support for generic drugs among Trump voters is the result of high support among seniors, who tend to be conservative but also have the largest drug expenses. Rural voters, who are more likely to live in an area with poor internet connectivity, accounted for a large portion of the support for a public internet utility. Ending cash bail and guaranteed jobs elicited opposition from Trump voters, but compared with most Democratic proposals, they are still quite popular. These four policies have potential to win over persuadable voters, but they also have immense potential among non-voters. 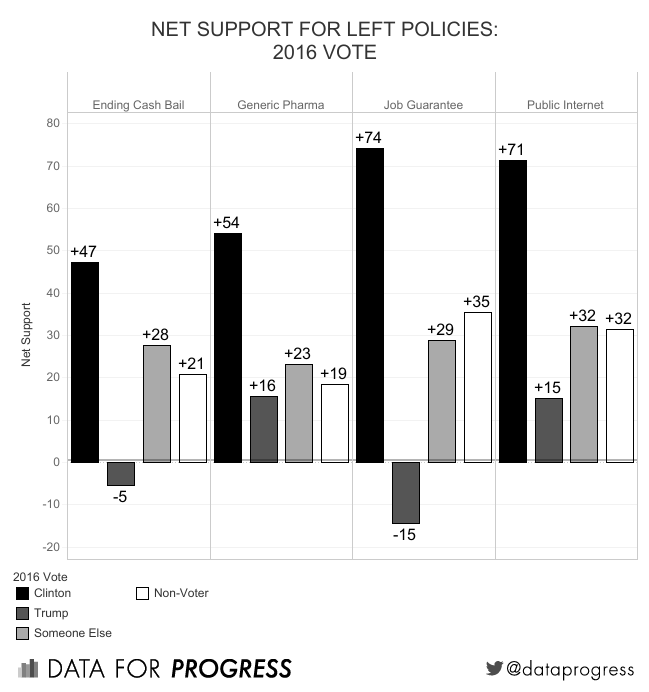 All of these policies have net support among non-voters, suggesting that Democrats could walk and chew gum at the same time - winning over persuadable voters while engaging with non-voters who might be interested in some new policies. Our four key policies (community job creation, ending cash bail, generic pharmaceuticals, and a public option for internet) are popular across race and education groups. 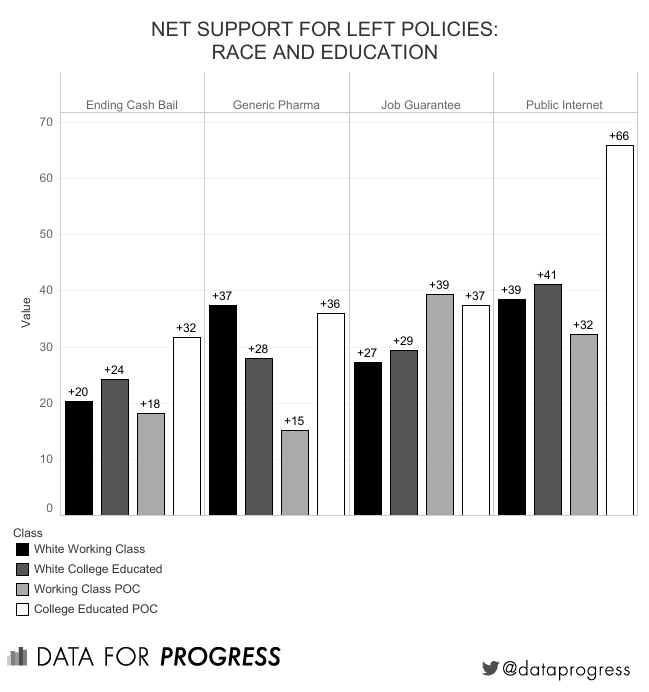 Working-class (defined as non-college educated) people of color are most supportive of the job guarantee, while working-class whites are most supportive of the generic pharmaceuticals proposal. College-educated people of color are most supportive of ending cash bail and a public option for internet (77 percent in support, 11 percent opposed). However, it’s worth highlighting again that all of these policies had net support greater than ten points across all groups. Many of the policies we examined often didn’t fall along traditional lines of public opinion support. 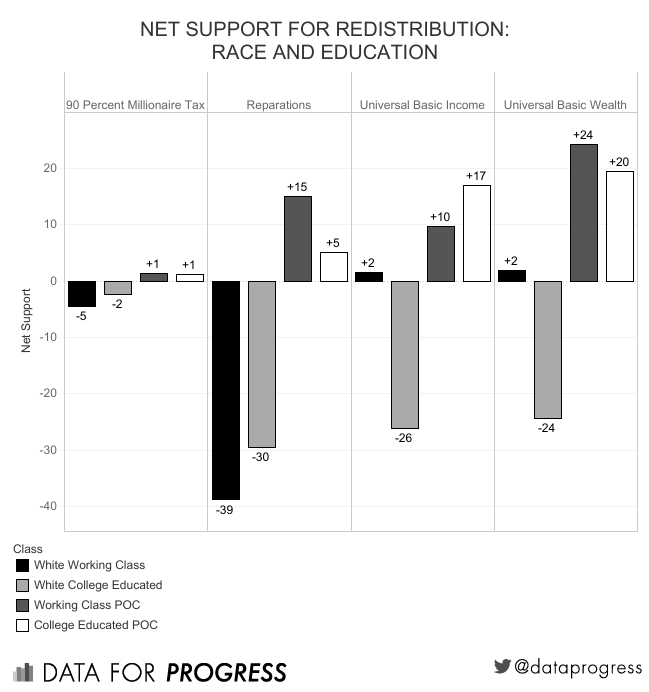 On some redistributive policies, working class and college educated voters have similar views. However, on the major redistributive policies we analyzed, the story is different (we define working class as non-college educated). The universal basic income is most popular among working class people of color, followed by college educated people of color. The proposal has net support among working class whites (among whites, the lowest education group had the highest support for universal basic income), but was rejected by college-educated whites. Universal basic wealth (giving every American a $5,000 savings account at birth that they can access when they turn 18, often called a “baby bond”) has the strongest support among college educated people of color, but is strongly opposed by college educated whites (28 percent in support, 53 percent opposed). A marginal tax of 90 percent on income over a million dollars (our version of a maximum income) had narrow support among people of color, but was opposed by whites. Analyzing income we see a similar trend: the universal basic income and universal basic wealth are most popular among low-income adults and least popular among higher income adults (even those who would not expect to see their taxes increase). Though some of the proposals we examine are currently unpopular nationally, that may change in the future. We find that four of the most radical proposals we analyzed are vastly more popular with younger voters than they are with the general public. For example, a universal basic income has net opposition among the general public (38 percent support, 40 percent opposed), but this is driven by net negative support of -16 among older individuals and net positive support of 15 points among individuals under 45. 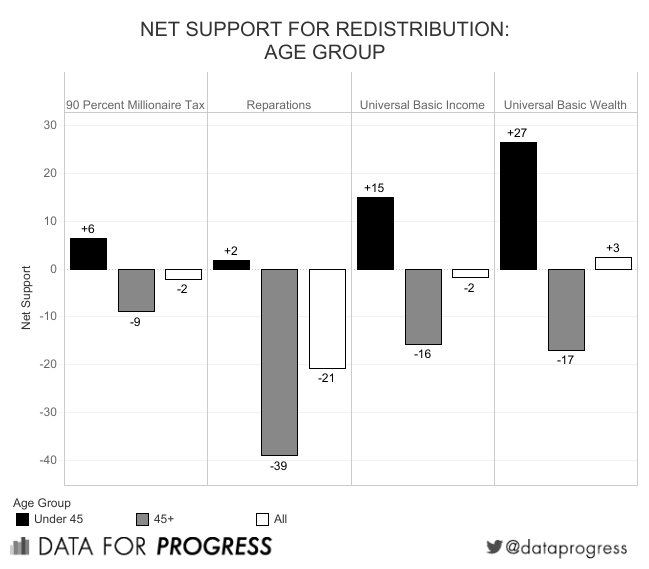 Universal basic wealth, which has net positive support among the general public is net -17 among older individuals but has net +27 point support among eligible voters under 45. Reparations are net negative -39 among individuals over 45, but positive +2 among under 45. Finally, our version of a maximum income (90 percent marginal tax rates on income over $1,000,000) has net negative support of -9 among individuals 45 or older, but had net support of +6 points among under 45s. Other progressive left policies that are waved away as radical by the pundit class are not considered as such by the general public. For instance, we polled a proposal to allow all Americans to start a bank account with the Federal Reserve. A plurality of voters took no position (46 percent didn’t know), but among those who did, the proposal had net support (+4 points). We find that a universal basic wealth plan (also called a baby bond) has net +2 support (40 percent in favor, 38 percent opposed). These policies are not as overwhelmingly popular as the others, but they would offer significant benefits without clearly risking electoral backlash. 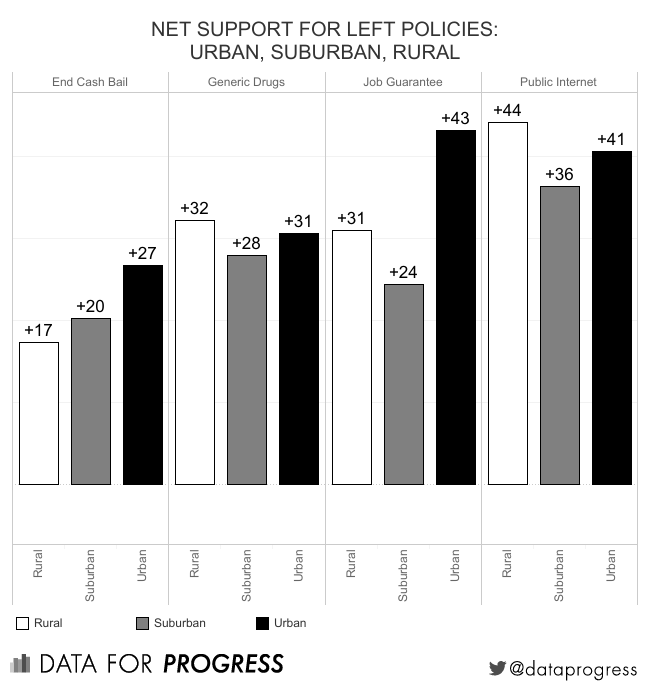 We found that some of our left policies are unpopular on net, but not dramatically so. A universal basic income, even with a question wording that specified paying for the plan by increasing taxes, is only net -2. There is also only a net -2 (32 percent in favor, 34 percent opposed) opposition to instituting a 90 percent marginal tax rate on income over a million dollars. Even a policy as controversial as reparations has net positive support among voters under 45, though nationally it has net negative of 21 percentage points among the general public (26 percent in favor, 47 percent opposed). Regardless of how popular or unpopular a policy is, we should remember that public opinion is inherently fluid. We did not provide partisan cues in our question wording and many of these issues have not seen sustained partisan debate, so many of these items are measuring people’s gut reactions to them. This is encouraging, in that it shows that people on average seem to intuitively see merit in progressive goals and proposals for how to achieve them. However, turning these favorable impressions into durable support will require activists and politicians to put these issues on the national agenda and make a forceful case for them over time. 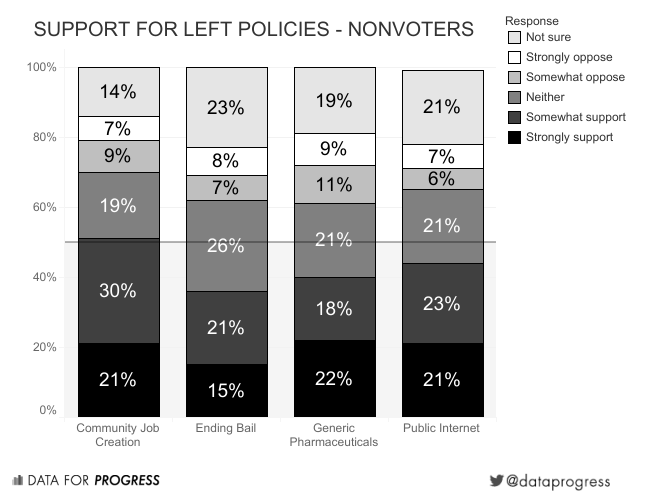 Key Finding 9: The least popular progressive policies are more popular than Republicans’ signature legislative proposals. By a lot. It’s important to keep some perspective here. According to the Real Clear Politics average, the Republican tax cut currently stands at net -7 percent approval. Data from the Kaiser Family Foundation showed that their failed attempt to repeal the Affordable Care Act polled at net -24 (meaning that the Republican healthcare bill is less popular than reparations). Six -- six! -- percent of the public supports cutting Social Security, according to the American National Election Studies. 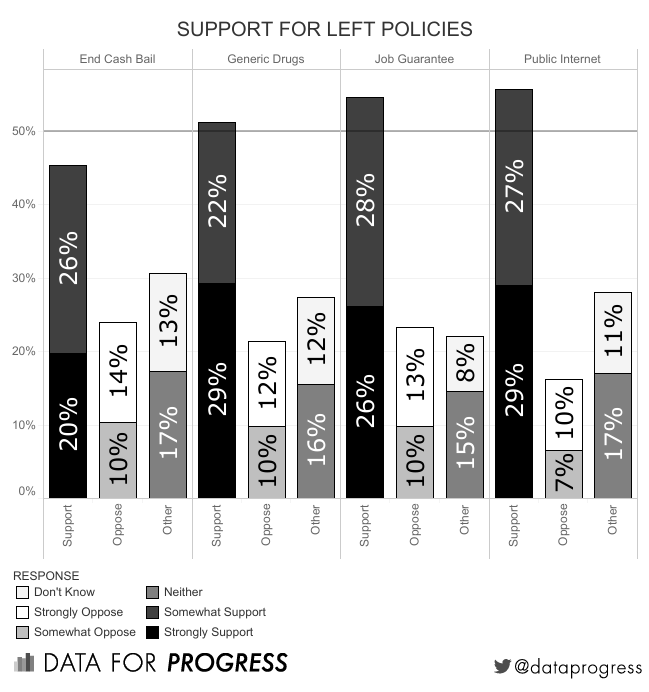 We did not find universal support for every progressive agenda item we polled -- nor did we expect to. However, we consistently found that voters are more likely to want big-ticket progressive agenda items that are dismissed by the pundit class as electoral doom than policies that Republican candidates regularly commit to on the campaign trail and pursue while in office. Key Finding 10: You tell us! Thanks to John Ray (@johnlray) of YouGov Blue for the vizualization box. Hit us up at @DataProgress. Would you support or oppose restoring the tax rate on earnings over $1 million to the Eisenhower-era rate of 90%? Would you support or oppose a government-run option for banking, which would allow Americans to open a bank account with the Federal Reserve the way financial institutions do? Would you support or oppose giving every American a monthly check from the government of $1,000, which would be paid for by raising taxes on individuals earning more than $150,000 a year? Would you support or oppose giving every American a $5,000 savings account at birth that they can access when they turn 18? Would you support or oppose defunding Immigration and Customs Enforcement (ICE) and enforcing immigration violations like other civil infractions? Would you support or oppose ending cash bail for individuals awaiting trial, and instead only detaining individuals pre-trial if they were a violence or flight risk? Would you support or oppose the creation of a publicly-owned internet company to fill coverage gaps in rural, urban, or remote areas that currently lack robust Internet access? Would you support or oppose having the government produce generic versions of life-saving drugs, even if it required revoking patents held by pharmaceutical companies? Would you support or oppose policies designed to reduce racial wealth gaps caused by slavery and Jim Crow, such as offering compensation or tax benefits to the descendants of slaves? Note on the job guarantee: We have analyzed three polls on a federal jobs guarantee from three different organizations with different phrasings and response options. Our results track closely with the results from Civis, but show lower overall support than the poll from Center for American Progress (CAP). This is likely the result of phrasing, since CAP listed specific jobs such as infrastructure, education, and child care which are generally popular among the public. The Civis and Data For Progress/Yougov polls did not specify what the jobs would be. In addition, the Civis and Data For Progress/Yougov polls included a the option for a neutral response while the CAP poll did not. It seems plausible that removing the neutral option leads many respondents to respond in support of guaranteed jobs. However, in every wording the job guarantee garnered majority support.